Read the latest news about 'our' organisation, both in Maidenhead and across the globe. Plus a regular review of the latest news and events from Gaza (Palestine). An aid volunteer from Maidenhead has spoken to the Advertiser just hours after his convoy violently clashed with Egyptian police. Razwan Khan awoke last night to find 300 riot police firing rubber bullets and rocks at his friends in the port of Al Arish in Egypt. "They just walked in and started smashing vehicles," he said speaking to the Advertiser on his mobile phone from the camp this afternoon. "A lot of people got injured and cut in the head. It was really bad. One guy had his front teeth smashed in." Many of the humanitarians were seriously injured and had to be hospitalised. Razwan escaped injury but was horrified at the level of violence which broke out after Egyptian police delayed the Viva Palestina aid convoy-which left London on December 6- at the border with Gaza. Convoy leaders had already agreed to re-route their journey after receiving guarantees from the Egyptian authorities of a safe passage to the war-torn country. Protests broke out when Egyptian authorities at Al - Arish ordered some lorries to use an Israeli-controlled checkpoint. The activists preferred the goods to be transported via Egypt's Rafah crossing as agreed. George Galloway who is leading the convoy said Israel is likely to prevent it entering Gaza - This morning he told Sky News. "It is completely unconscionable that 25 percent of our convoy should go to Israel and never arrive in Gaza." When we spoke to Razwan they were still queuing up to leave. He hopes to be home next week. Twenty-year-old Yahya Abu Saif lies in his hospital bed looking wide-eyed, gaunt and scared. 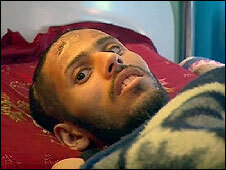 He was lucky to survive an Israeli air strike. But, like so many others in Gaza, his life was transformed in an instant. He lost his right leg in the explosion. The left side of his body is paralysed. "I had just left the mosque near my home and was going home after prayers," he says, with a little difficulty. "They dropped a bomb on the mosque and I was thrown in the air, but I don't remember what happened after that. "My family told me 15 people were killed and 20 people injured, including me." Yahya says he used to go to university and wanted to be a teacher one day. "Now I will have a life of hospitals. I know I will just need medical care forever." As we left the room, we found Yahya's elder brother outside, wiping away tears. Al-Wafa Hospital, to which Yahya has been admitted, is the only one in Gaza which specialises in treating amputees. At a time when hundreds more people need its care, the hospital itself was shelled and damaged in the fighting. "It was a miserable time for us and the patients," says Dr Tariq Dardas. "From midnight on 16 January until 9am, there was constant shelling. We called the Red Cross and civilian defence to help us leave, but nobody would come to this area under those circumstances. "All the staff members were scared but, of course, we could not leave our patients. "Many of them had spinal injuries or were paraplegic. It was so difficult for us to move them all to the other side of the building, but thank God we did. One elderly patient sustained head injuries, but it could have been much worse." Dr Dardas shows us parts of the building he says were hit by tank shells. "Ninety percent of the windows have been broken, some rooms have been totally destroyed. About one-third of our new building has been destroyed. It has had a big impact on what we can do," he says. "We estimate several hundred people have lost limbs and are in need of rehabilitation here. We feel shy to tell patients that they can't come here; they have a right to come, but we have no choice." The health system in Gaza is under tremendous strain. Not just because of the thousands of injured following the Israeli offensive, but also because of the physical damage done to medical facilities like Al-Wafa. There also continue to be the difficulties of bringing supplies into Gaza while the crossings into the territory are tightly controlled. 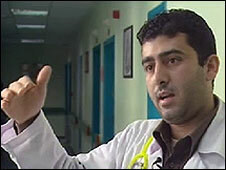 To ease the pressure, scores of patients were allowed through Gaza's border with Egypt for short-term treatment abroad. But most will soon return. Al-Wafa Hospital is one of the few places in Gaza which could provide them with specialist psychiatric assistance to come to terms with their new realities. Right now, Al-Wafa itself is appealing for help. Me at El-Wafa Rehabilitation Hospital, in the staff room with Dr Bursch and Dr Dardas. 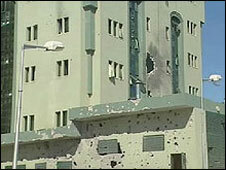 The staff room was riddled with bullet holes, and several windows were still broken, it was very sad to see that the Hospital Patients and Staff were attacked in such a manner.